A Brooklyn Museum Wedding is set in the heart of one of the most diverse, creative, and exciting urban centers in the world. The museum is New York City's third largest in physical size and holds an art collection with roughly 1.5 million works. The borough of Brooklyn has a rich artistic heritage, one that the Brooklyn Museum has vowed to honor. The museum is meant to act as a bridge between the beautiful artistry located within its walls and the unique experience of each visitor. A Brooklyn Museum Wedding is a delightful event surrounded by culture and creative energy. The museum is home to an expansive sheer glass pavilion that overlooks a public plaza and melds the historical and contemporary components of the building. 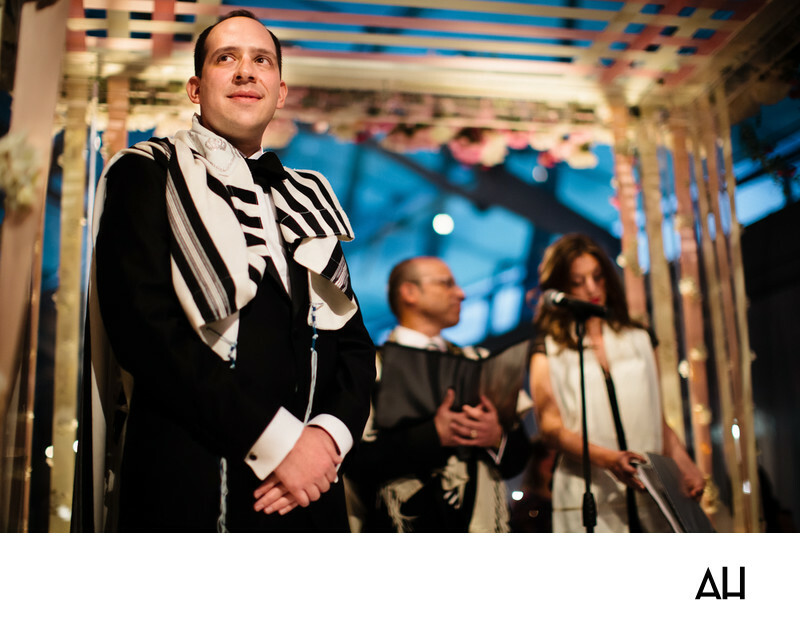 This image from a Brooklyn Museum Wedding shows the groom at a Jewish ceremony. The groom wears a tuxedo and traditional attire for a Jewish wedding. The face of the groom is the highlight of the photo, as he watches his bride walks down the aisle. Behind him the rabbi and a singer make conversation under the chuppah as they wait for the ceremony to begin. With all the attention on the bride as she walks into the room, most forget about the groom until she has made her way to him. I have found that this is one of the most endearing moments to behold at any wedding. The expression on the face of the groom is always full of wonder, even if he had seen the bride earlier for a first look photograph. This is the moment when he fully realizes that when the day is through he will be married to the woman of his dreams.